Google Dropping Google+ Name Link? 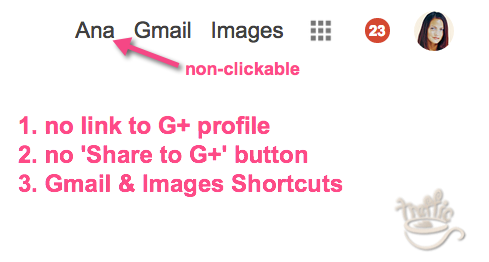 Home > Google News > Google+ Hyperlink No Longer Working? Google+ Hyperlink No Longer Working? Many are reporting that the link to your name at the top right of Google properties, after you are signed in, no longer links you to your Google+ profile. Here is a picture from Ana Hoffman on Google+. I still see the hyperlink for myself, and it says Barry+ and to Google+ for me, but many are not seeing it. Techmeme has tons of coverage of Google dropping Google+ from the navigation. Another sign that Google+ is dying and Google has shifted focus away from the ever so important social network. To access Google+, you need to go to the app section of the navigation bar - way deep into the navigation.